Recovering from depression is a two-step process. First, you must get better. Then, you must stay better. Clinical depression is one of the most common mental disorders in the United States. 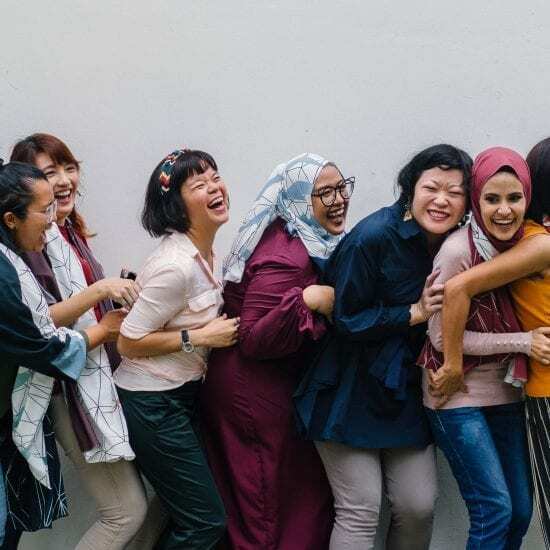 According to the National Institute of Mental Health, 6.7% of American adults–over 16 million people–suffered from at least one major depressive episode in 2016. The good news is that depression is treatable, usually with a mix of talk therapy and medication. Sadly, depression is also episodic and recurrent, meaning that people who suffer once are likely to relapse or experience symptoms again. In other words, treating depression is a two-step process: First you must get better, then you must stay better. Most conventional depression treatment focuses on the first half of treatment while neglecting the second, which can lead to high rates of relapse among patients. Enter Mindfulness-Based Cognitive Therapy (MBCT), a promising solution and the subject of J. Mark G. Williams, John D. Teasdale, Zindel V. Segal, and Jon Kabat-Zinn’s book The Mindful Way Through Depression. Depression, the authors discovered, alters neural pathways in the brain in such a way that even normal sadness can lead to a recurrence of depression symptoms. 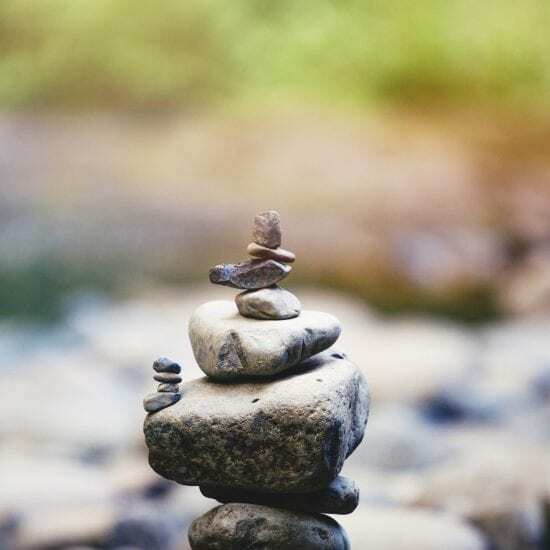 MBCT gives patients a set of tools to keep themselves grounded and aware during life’s darker moments, and is showing to be a successful way to help not just sufferers of depression, but anxiety and post-traumatic stress disorder, too. 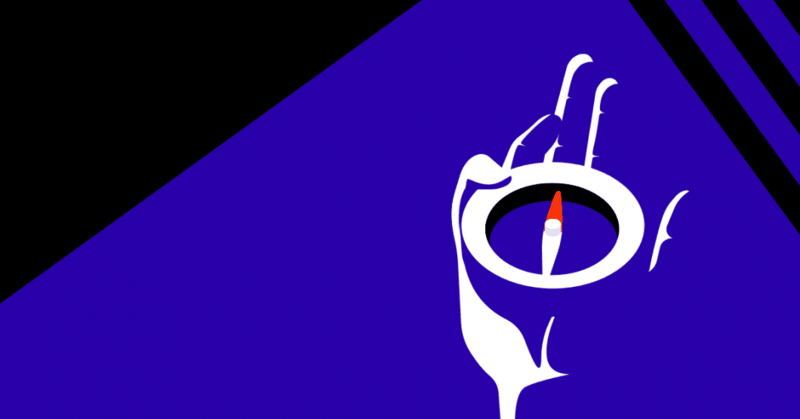 We’ve compiled our top three tips to help curious readers get started. If you’d like to read book yourself (and we highly recommend it), try your local library! In The Mindful Way Through Depression, the authors spend the first few chapters explaining the connection between the mind and body and how that translates into depression for those suffering. There is a biological difference in the brain between people who have suffered a depressive episode and those who have not. Causes of depression vary from person to person but depressive episodes have one major thing in common: A trigger. Triggers come in all shapes and sizes. The sudden death of a loved one or a traumatic injury are obvious examples, but triggers can also be unassuming. A promotion at work, for example, may seem like a good thing. But if you find yourself unhappy with the change, the stress and feelings of inadequacy can quickly pile up. If this sounds a little too familiar, take a moment to relax and release some of those feelings. 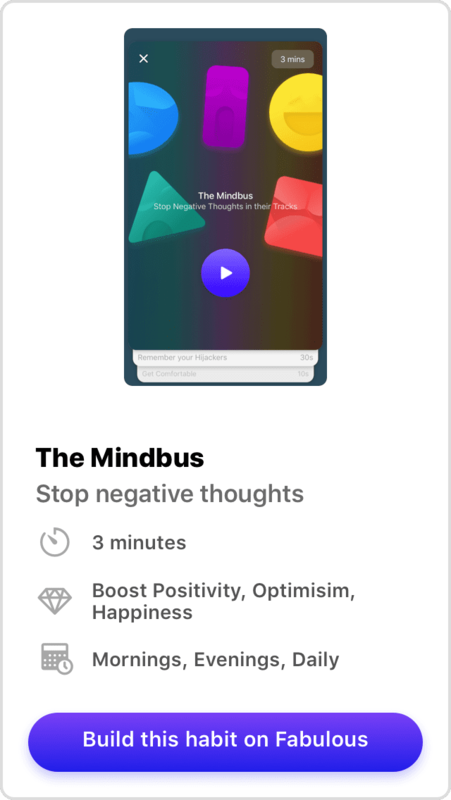 If you have a few minutes, Fabulous’s inspirational exercise The Mindbus can be a great help for banishing negative thoughts (though it’s no substitute for medical help). Some triggers may be impossible to avoid. The object isn’t to run away from these triggers, but rather simply identify what they are and how you react to them. If, for example, a certain song reminds you of a traumatic moment in your life, you should make note of how it makes you feel when you hear it. Becoming fully aware of your triggers and how they affect you better prepares you for experiencing them later. You may not be able to avoid that song forever but you can take steps to prevent yourself from spiraling if you hear it playing at the grocery store or in a restaurant. When you’re in a depressed state, your mind is working overtime. Not only does it have to process what’s happening around you, it also has to process everything happening inside you, too. The maelstrom of self-doubt, hopelessness, and despair can make it difficult to even breathe. Going through life while depressed can feel like trying to solve a 1,000-piece jigsaw puzzle while you’re drowning. No wonder those suffering feel exhausted all the time! Your everyday experience is made up of both the things that happen to you and your interpretation of them. However, when your focus is just on your interpretation, you can get bogged down by all sorts of unhelpful or unnecessary thoughts and feelings. For example, if you’re at a performance review at work, and your supervisor describes your efforts as “satisfactory,” that might be all it takes to send you into a tailspin of misery. What does “satisfactory” mean? Is that just a polite way of saying “barely good enough”? Did I do something wrong? Is this the end of the line for me? It’s during moments like these when you need to stop focusing on what you’re doing, thinking, or feeling, and simplify your sensory awareness to just what you are. Rather than thinking of your emotions as problems to be solved, you’ll see them for what they really are: Feelings, usually fleeting, and a perfectly normal part of the human experience. One fantastic way to get into the habit of enhancing your awareness is to practice body scan meditations. Fabulous has one built right into the app: Find it in Make Me Fabulous and give it a shot! Imagine for a moment that you’re in a busy shopping center when you see someone clutch their chest and collapse on the ground. They obviously need CPR. Who do you think would be better-prepared to administer it: Someone who’s read a step-by-step guide but never practiced, or someone who has been CPR certified for years? The answer is obviously the latter, because they’ve had more practice! And not only that, they’ve had practice in low-intensity situations, like in a classroom or a workshop, and practiced on a mannequin. Being able to practice these vital life-saving skills in a low-stakes environment makes it much easier to retain the information you’ve learned so, should a crisis strike, you’re well-prepared to handle it. It’s this exact reasoning that you should absolutely practice MBCT when you’re not in a depressive state, even if you think you don’t need it. You may be on the mend now but symptoms can recur unexpectedly and you’ll want to be ready when they do. Set aside a time of day every day to practice a moment of mindfulness. Add the Meditation habit to one of your daily rituals to remind you. 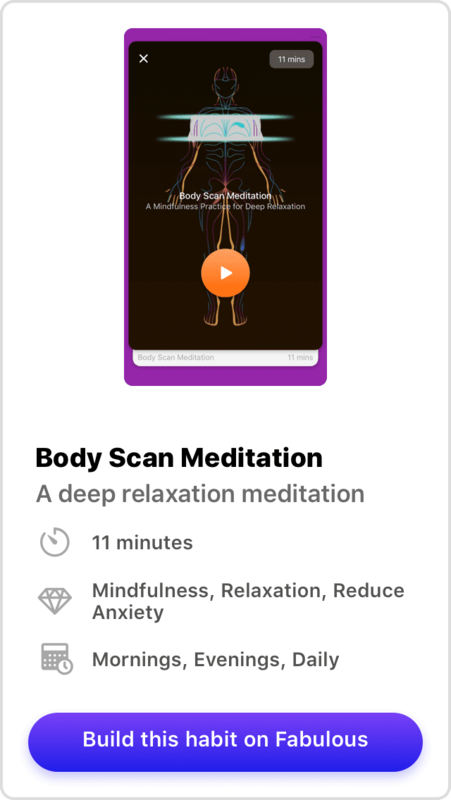 Fabulous also has plenty of guided meditations to help you with your mindfulness practice. 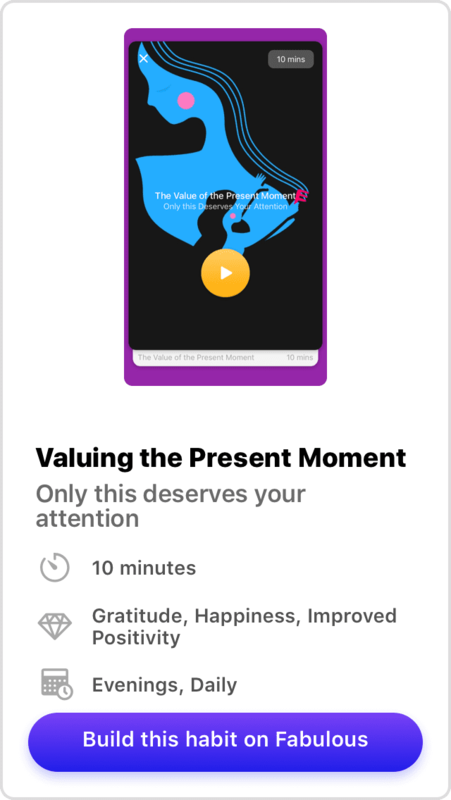 We recommend starting with The Value of the Present Moment. Depression is treatable but relapses can strike at any time. It’s easy to get discouraged by the possibility of never getting better, which is exactly where MBCT comes in. 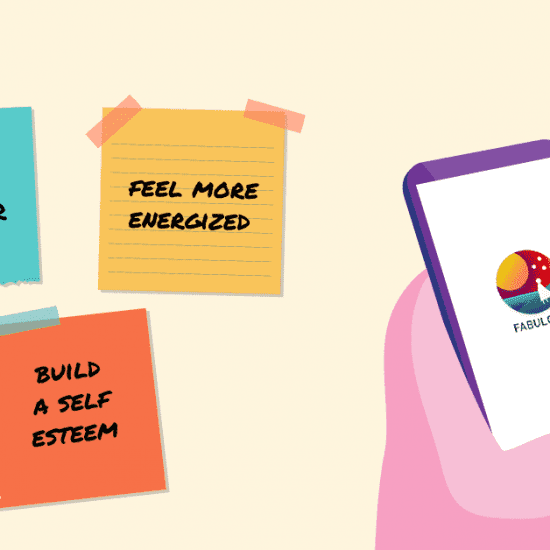 By practicing mindfulness regularly, you’re building the skill sets you need to keep depression at bay when symptoms arise. It’s like any other chronic illness; those who suffer must always be vigilant in taking care of themselves, even when they feel fine. Finally, the most important thing to remember going forward is that no matter how you may feel, you’re not alone. If things are too much to handle on your own, reach out to a friend or someone you trust. Connect with other Fabulous users about your experiences. Seek help from a trained professional. And remember that you are valuable and loved.